Three days earlier I had purchased the bicycle I still ride and love today, a new 1992 Cannondale R500 which I would soon dub “Canny”. Today I overslept by 2 hours, to Ken Loo’s chagrin I’m sure, but I gain consciousness by 6:00 a.m. I call Ken, rush over to his house, and we are in El Dorado Hills (~20 miles east of Sacramento) by 8:00 a.m. The scenery is gorgeous and today we are faced with 5700 feet of climbing, although we choose to only do the 70 mile ride, rather than the 100 mile ride (with 7000 feet of climbing). The air is crisp and clean, and I am joyous to be heading off into the sunset on my new steed. The ride is hilly, no doubt about that, but we survive the 1st “leg” and get something to eat. The 2nd leg is the subject of everyone’s talk, as it is the hillest and most challenging of all. My Cannondale, with Shimano RX100 components, has a then-rare triple crankset, and I am thankful I spent the extra $20 for it over the Cannondale R400 with otherwise similar components. Ken is riding his trusty Motiv mountain bike, which he rode impressively on the Delta, but is feeling its extra 10 lb heft today on the hills. The second leg is steep all right, and we are only going 5-7 miles per hour according to my new Vetta cyclocomputer with cadence. Ouch, my calves cramp up bad, and I have to dismount. I am walking like a robot up the hill, and for a couple of minutes Ken is nowhere in sight. Eventually, though, he I see him, and he tells me he asked a woman rider who passed about my whereabouts, in which she responded that I was walking. A couple minutes later, though, I’m ready to go. Never would I have guessed that that would have been the very last time I would ever have to walk on a 100-mile ride. There were several signs on the way up that posted a 25 mph speed limit, so we knew that things would be, er, exciting on the way down! The scenery was spectacular, with its grandiose redwood tries, and the roads were pretty wide, just twisty. Soon we would be flying down under gravity’s power. I glance at my cyclocomputer, and then exclaim “40 miles per hour!” But things are getting really hairy. “BRAKE!” Ken shouts. We had underestimated the upcoming corner, and we are well into the other lane. We get pretty close to the edge, and we knew we were extremely lucky there were no cars going around. “Phew, better be more conservative in those corners from now on,” we think. 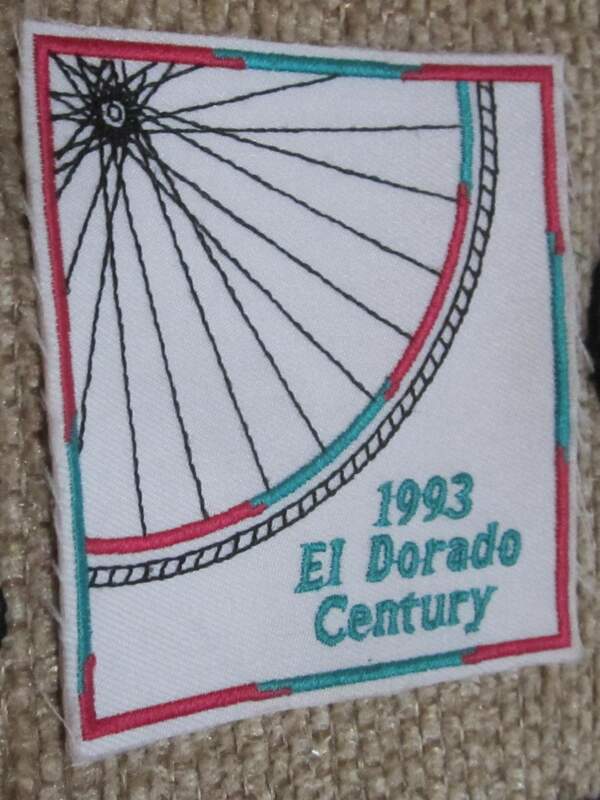 The rest of the El Dorado Century goes through scenic waterways, but towards the end the surrounding terrain is yellow and barren. Still hilly, but not nearly as gorgeous as before. I forget when we arrive back, but I believe we averaged 11.5 mph. This made us proud, as we had never ridden in such hilly terrain before. Never would we have guessed that next year that our average speeds would be far exceeding this, but nevertheless this was a wonderful ride.